EAN is similarly widespread, with an estimated half million senior citizens becoming the victims of abuse or neglect in the USA each year. Perhaps more concerning is the fact that EAN is so difficult to identify; it has been estimated that for each case of EAN identified, 23-24 go unnoticed and untreated. As the baby boomer generation ages, EAN represents an increasingly devastating threat to population health in the USA. Street-based community violence may be gang-related, stem from interpersonal conflicts over property/significant others, or stem from territory/neighborhood prejudices. Community violence takes an especially epic toll on America's youth. In 2009, over 668,000 people between the age of 10 and 24 years were treated in the Emergency Departments in the USA for injuries resulting from violence. Furthermore, homicide remains the leading cause of death for young men of color between the age of 15 and 25 years. Unfortunately, incarceration, patchy and controversial gun control laws, and school-based violence prevention efforts have failed to appreciably decrease the level of violence on our streets. Hospital- and emergency department-based initiatives to treat IPV are increasingly common, but the prevalence of similar pathways to improve care for victims of elder abuse or those injured by street-based community violence is unknown. Limited data suggest that hospital-based "violence interruption" workers can reduce the frequency of re-injury among injured patients as well as reduce retaliatory harm in street-based community violence; however, the extent to which these programs and others are used in hospitals in unknown. , Previous work has also documented that hospital-based care providers' knowledge of the characteristics and management of suspected elder abuse is limited. There has been no study of the existence or the effectiveness of hospital-level programs to identify and treat elder abuse and neglect. To address these gaps in knowledge, our study used a web-based survey of trauma medical directors at 62 Illinois Level I and Level II trauma centers. Our goals were to investigate the availability of resources for social support and ambulatory referral for victims of IPV, EAN, and SBCV at Trauma Centers in the state of Illinois and to assess trauma medical directors' perceptions of the scale of these injuries at their institution and the adequacy of condition-specific resources for social support and referral. Illinois Trauma Centers carry a heavy burden of responsibility for the care of injured people statewide, including those injured by violence. We conducted a prospective survey to assess existing institutional resources for the identification and treatment of violence victims among patients presenting with acute injury. The directors of the 62 Illinois Level I and Level II trauma centers were contacted via an email, which described the purpose, risks, and benefits of our study, and our plans for confidentiality. Follow-up telephone calls were made to providers who did not respond to three emails over 3 months. The survey instrument was based on a similar survey of trauma service medical directors conducted in 2004, which addressed trauma center resources for IPV. This new survey collected data on IPV, EAN, and SBCV resources. Data were abstracted and coded by institution and geographical region. Data analysis was performed using STATA statistical software. Means were compared using Student's t test; categorical data were analyzed using Fisher's exact test of binomial proportions (because we had small expected values in some tables) or R × C contingency tables for variables that had more than two categories. Online surveys were filled out and returned by 29 of the 62 Illinois trauma centers. An additional 17 trauma nurse coordinators from initial nonresponders participated in the survey after contact by telephone. A total of 46 trauma centers (74%) participated in this survey; 15 of these trauma centers had a Level I designation (33%) and 31 had a Level II designation (67%). Of the participating hospitals, 15 were in an urban location (33%) and 31 were in a suburban or rural location (67%). All identified respondents were the trauma nurse coordinators for their respective hospitals, and all but one of them (97%) were female. Eighty-eight percent of hospitals surveyed thought IPV was a problem in their area, nearly identical to the proportion of hospitals (87%) that thought IPV was a problem in their area 3 years ago. Eighty-three percent of respondents thought that their hospitals' services for IPV were adequate [Table 1]. This is an increase from what was 3 years ago, when 76% of the respondents thought that their hospitals' services for IPV were adequate, although the difference was not statistically significant (P = 0.55). Level II trauma centers were significantly more likely than Level I trauma centers to believe their services for IPV were adequate (P = 0.007). Overall, 100% of hospitals surveyed screened for IPV and 81% of hospitals tracked cases of IPV. The most common screening policy was to screen all patients (96%) with the remaining hospitals screening cases in which there is suspicion of IPV. This is a significant improvement (P < 0.001) over the screening and tracking policies for IPV 3 years ago, when 94% of hospitals screened for IPV, 51% screened all patients, and 62% subsequently tracked cases of IPV. Screening and tracking policies for IPV were highly similar between rural versus urban hospitals or Level I versus Level II trauma centers. All hospitals surveyed had some form of referral service for victims of IPV. All hospitals had social workers available, and many hospitals (37%) were also equipped with dedicated response teams (DRTs). This demonstrates a trend toward improvement in both availability and quality of referral services for IPV from 3 years ago, when 94% of hospitals had social consults (P = 0.3) and 18% had DRTs (P = 0.1). No significant differences were found between the availability of services for IPV victims in rural versus urban or Level I versus Level II comparisons. Trauma centers were asked what they thought the most important services they could provide to victims of violence were and 97% answered social consults, 83% answered shelter referral, 72% answered educational resources, 62% answered drug and alcohol counseling, and only 31% answered job resources. These are quite similar to the responses in the survey conducted in 2004 (no statistically significant differences were found). When asked what public policy measures could be taken to improve the care for IPV victims, better community resources were identified as having the most potential use (82%), followed by coordinated educational programs (75%) and outside funding (68%). Sixty-five percent of the respondents thought that EAN was problematic in their hospital area, and 70% of the respondents thought that their services for EAN were adequate. Level II hospitals were more likely to believe that their services for EAN were adequate than Level I hospitals. Across the board, hospitals thought that there had been no significant improvement in their resources for EAN over the past few years. 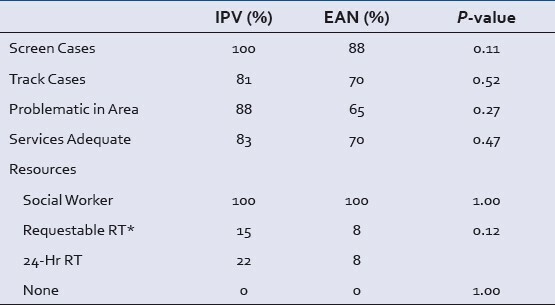 [Table 2] compares EAN with IPV resources. The majority (88%) of hospitals reported a screening policy for EAN; most hospitals with a screening policy screen all patients (65%), with the remaining hospitals only screening cases deemed suspicious. Level II hospitals were significantly more likely to screen for EAN than Level I hospitals (100% vs. 57%, P = 0.02). The majority of respondents also reported that their hospitals tracked cases of EAN (70%). All hospitals surveyed had some form of referral service available for victims of EAN; every hospital had social workers and 16% also had dedicated response teams (DRTs). No significant differences were found between the availability of services in rural versus urban or Level I versus Level II comparisons. When asked which services would be most useful for victims of EAN, 93% of hospitals indicated social consults and 76% of hospitals indicated shelter referral. From a public policy perspective, 74% of the respondents thought that better community resources would have the most potential use, followed by outside funding (70%) and then coordinated educational programs (59%). There were no significant deviations from any of these patterns when comparing Level I with Level II trauma centers or when comparing rural with urban hospitals. Three quarters of the respondents thought that SBCV is a problem in the region surrounding their hospital, but only 35% of the hospitals thought that their services for SBCV are adequate. This is significantly less (P < 0.001) than the proportion of hospitals that thought that their services for IPV are adequate (83%), although hospitals thought that both types of violence were similarly widespread. Urban hospitals were more likely (P = 0.06) to think that SBCV is a problem in their area than rural hospitals. Level II hospitals were more likely to believe that their services for SBCV are adequate than Level I hospitals. Overall, hospitals thought that there had been no improvement in their resources for dealing with victims of SBCV over the past few years (73% responded that there had been no improvement, 12% responded that there had been some improvement, and 15% responded that services had actually gotten worse). [Table 3] compares SBCV with IPV resources. Sixty-one percent of hospitals reported a screening policy for SBCV, and a third of hospitals subsequently track cases of SBCV. In both screening and tracking, the difference between IPV and SBCV was significant, with P < 0.001 in each case. The most common policy for hospitals that screen for SBCV is to screen all patients (35%), with the remaining 26% screening only in cases deemed suspicious. Level II trauma centers were more likely to screen for SBCV than Level I trauma centers (73% vs. 43%, P = 0.34), although because of the low numbers, this did not reach statistical significance. There were no significant differences found in screening or tracking of SBCV between rural and urban hospitals. Hospitals were found to have significantly fewer services available for victims of SBCV than for victims of IPV: Although 87% of hospitals have social workers for victims of SBCV, only 9% of hospitals provide them with DRTs; 13% of hospitals had no resources for dealing with SBCV victims beyond basic medical care (P = 0.02). No significant differences were found between the availability of services for SBCV in rural versus urban or Level I versus Level II comparisons. Trauma centers were asked what they thought the most important services they could provide to victims of violence were and 81% answered drug and alcohol counseling, 73% answered educational resources, 69% answered educational resources, 38% answered shelter referral, and 27% answered job resources. When asked what public policy measures could be taken to improve care for victims of SBCV, the largest proportion of respondents answered better community resources as having the most potential use (93%), followed by coordinated educational programs (68%) and then outside funding (43%). There were no significant deviations from these patterns when comparing Level I with Level II trauma centers or when comparing rural with urban hospitals. Thematic saturation could not be achieved for most answers, because most narrative comments reflected the original questions, such as "Yes, we screen everyone," or "Community Violence is a big problem in our area." Only in the areas of Screening Tools Used and Perception of Problem and Adequacy of Services were fields sufficiently populated for analysis. The majority of hospitals surveyed use brief, scripted screens to identify victims of violence, using questions which fell into four general categories: (1) Questions about whether the patients feel safe in their current living situation (eg, "Do you feel safe at home," "Do you feel threatened at home"); (2) Questions determining whether patient is in a harmful relationship or being victimized by someone in particular (eg, "Do you feel safe in your relationships," "Is anyone causing you to be afraid"); (3) Retroactive questions about whether an injury was caused by violence (eg, "Have you been intentionally hurt," "Did someone else cause these injuries"); (4) Questions determining whether the patient feels safe in general, without specifying any particular person or place (eg "Are you in any situation where you feel threatened," "Are you fearful for your safety"). Most respondents ask at least one question from the first two categories, but there was substantial variation in the wording of the questions and the combinations of questions used. Less frequently, screens included self-harm in their questioning ("Have you recently thought of hurting yourself") or questioned patients based on a less direct but more comprehensive definition of abuse ("Is anyone withholding food, money, or shelter from [you]"). The majority of respondents thought that all three types of violence included in the survey (IPV, SBCV, and EAN) were a problem in their area. However, they expressed concern that they may still be underestimating the extent of violent injuries among their patients. One respondent admitted that "there are more cases that we are not aware of and more in depth investigation would reveal more cases" and another expressed a belief that "there are under-identified populations at risk." Respondents also seemed to think that violence levels in their area were either stable or on an upswing ("Street drug use among teens has increased in the last year along with domestic violence and child abuse"). One respondent stated that the increase in violence seen at her hospital was not surprising "in light of the state of the economy." In terms of the services they provided their patients, hospitals were heavily reliant on social workers to care for victims of violence ("We… request their assistance on most violent cases") and highly satisfied with their effectiveness ("They are excellent at locating the appropriate referrals according to the needs of the patient"). However, some respondents also expressed a desire for dedicated response teams at their hospital to augment the services provided by their social work departments (eg, "Having a dedicated response team approach would be a great resource," "[I] would like a dedicated response team for all three categories listed"). Overall, trauma centers have continued to improve screening and referral practices for victims of IPV, and appear to provide adequate services for EAN. Since the Crandall et al. study on IPV in 2009, screening, tracking, and services for IPV have all improved, although, interestingly, respondents did not perceive any change in IPV services. Although SBCV is considered a problem in all communities, screening and referral practices lag behind those for IPV and EAN. 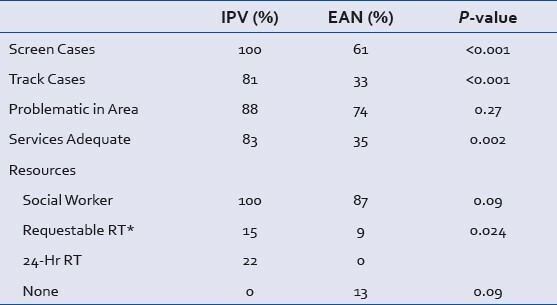 Every hospital screened for IPV, the large majority screened for EAN, and a smaller proportion screened for SBCV. For all the three types of violence, fewer hospitals tracked cases than screened for victims. Level II trauma centers reported higher rates of screening and tracking violence (with the exception of screening for IPV, which all hospitals practiced) than Level I trauma centers. This may be due, in part, to time constraints experienced by Level I trauma centers given their larger volume of patients. It is unclear whether tracking cases of violence would improve outcomes, but may help identify patients at risk of recurrent injury and improve case management. When asked which referral services would be most useful in their care of violence victims, hospitals most often identified social consults and then shelter referral in cases of IPV or EAN. In the case of SBCV, drug and alcohol counseling was the most common response, followed by educational resources. For both IPV and SBCV, job resources was the least common response (with a minority of respondents in each case), although the state of the economy was recognized as a risk factor by several providers. It is possible that although providers understand the importance of financial solvency, they may feel that it is out of the purview of trauma centers. 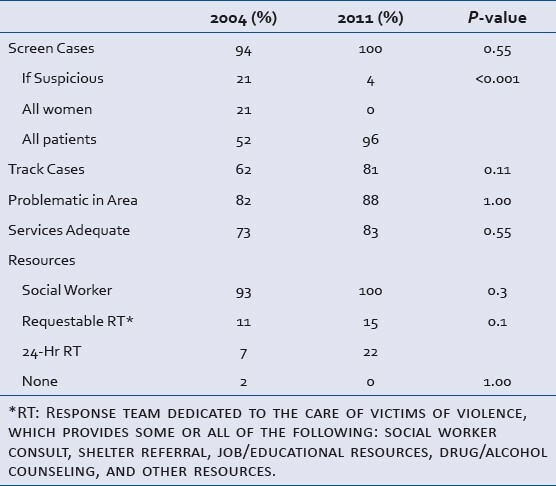 When asked which resources they thought would be useful in caring for victims of violence, hospitals consistently ranked better community resources over coordinated educational programs for staff and outside funding, perhaps reflecting a belief that longer-term care, case management, and rehabilitation of violence victims is better accomplished by efficient referral of victims to programs outside the hospital itself. There were several limitations to the study. For one, responses were only gathered from Illinois trauma centers, and may therefore not be generalizable to other states, where different social and legal conditions prevail. Although this survey tool was adapted from a previous study, it has not been externally validated outside of Illinois. Second, we did not define terms such as domestic violence, screening, and tracking in our survey. Although this was somewhat intentional (some vagueness in the wording could allow for inclusion of a wider range of responses), this may also have led to some confusion for respondents. The results may also suffer from respondent bias, which might over- or underestimate the services provided by hospitals to victims of violence. For example, the trauma centers that did return the survey may have been those that were satisfied with their screening and referral efforts, introducing a positive bias. Finally, we did not reach our goal of an 80% response rate, despite multiple contacts including emails and telephone calls. This reduces the power of our study and may increase the chance that we missed some differences between trauma centers (eg, rural vs. urban, Level I vs. Level II) that actually exist. Moving forward, an important finding from our study is the lack of uniformity in screening, tracking, and referral practices for victims of violence. This was observed in a previous study of IPV screening and referral practices, but our study extends the same observation to cases of EAN and SBCV and demonstrates that there has been no recent standardization of IPV protocols. The multiplicity of strategies for tracking and referring victims of violence in Illinois makes it difficult to assess the extent of violence and abuse statewide, assess the effectiveness of any given method of tracking/referral in preventing future violence, or form generalized policy recommendations for the care of violence victims. This presents an immediate opportunity for hospitals and public health organizations (at the local, state, and national levels) to improve care delivered to victims of violence by standardizing care and referral protocols. In the short term it would make the care of IPV, EAN, and SBCV victims less confusing for health care practitioners and patients alike, and in the long term it would improve the ability of public health agencies to gather data on care/referral effectiveness and streamline their ability to make appropriate policy changes. 1. Centers for Disease Control and Prevention. Atlanta, GA. Understanding Intimate Partner Violence. Available from: http://www.cdc.gov/violenceprevention/pub/ipv_factsheet.html [Last accessed 2013 Mar]. 2. Dearwater SR, Coben JH, Campbell JC, Nah G, Glass N, McLoughlin E, et al. Prevalence of intimate partner abuse in women treated at community hospital emergency departments. JAMA 1998;280:433-8. 3. National Center on Elder Abuse. Washington, DC. 2005 Elder Abuse Prevalence and Incidence. Available from: http://www.ncea.aoa.gov/Resources/Publication/docs/FinalStatistics050331.pdf [Last accessed 2013 Mar]. 4. Preventing elder abuse: Can we learn from child protection? Lancet 2011;377:876. 5. Centers for Disease Control and Prevention. Atlanta, GA. Youth Violence: Facts at a Glance. Available from http://www.cdc.gov/violenceprevention/pub/yv_datasheet.html [Last accessed 2013 Mar]. 6. Cunningham R, Knox L, Fein J, Harrison S, Frisch K, Walton M, et al. Before and after the trauma bay: The prevention of violent injury among youth. Ann Emerg Med 2009;53:490-500. 7. Sims DW, Bivins BA, Obeid FN, Horst HM, Sorensen VJ, Fath JJ. Urban trauma: A chronic recurrent disease. J Trauma 1989;29:940-6. 8. Cannon EA, Bonomi AE, Anderson ML, Rivara FP. The intergenerational transmission of witnessing intimate partner violence. Arch Pediatr Adolesc Med 2009;163:706-8. 9. Orth U, Montada L, Maercker A. Feelings of revenge, retaliation motive, and posttraumatic stress reactions in crime victims. J Interpers Violence 2006;21:229-43. 10. Iverson KM, Gradus JL, Resick PA, Suvak MK, Smith KF, Monson CM. Cognitive-behavioral therapy for PTSD and depression symptoms reduces risk for future intimate partner violence among interpersonal trauma survivors. J Consult Clin Psychol 2011;79:193-202. 11. Mosqueda L, Burnight K, Liao S, Kemp B. Advancing the field of elder mistreatment: A new model for integration of social and medical services. Gerontologist 2004;44:703-8. 12. Zun LS, Downey L, Rosen J. The effectiveness of an ED-based violence prevention program. Am J Emerg Med 2006;24:8-13. 13. Johnson SB, Bradshaw CP, Wright JL, Haynie DL, Simons-Morton BG, Cheng TL. Characterizing the teachable moment: Is an emergency department visit a teachable moment for intervention among assault-injured youth and their parents? Pediatr Emerg Care 2007;23:553-9. 14. Becker MG, Hall JS, Ursic CM, Jain S, Calhoun D. Caught in the Crossfire: The effects of a peer-based intervention program for violently injured youth. J Adolesc Health 2004;34:177-83. 15. Shibru D, Zahnd E, Becker M, Bekaert N, Calhoun D, Victorino GP. Benefits of a hospital-based peer intervention program for violently injured youth. J Am Coll Surg 2007;205:684-9. 16. Anthony EK, Lehning AJ, Austin MJ, Peck MD. Assessing elder mistreatment: Instrument development and implications for adult protective services. J Gerontol Soc Work 2009;52:815-36. 17. Crandall M, Schwab J, Sheehan K, Esposito T. Illinois trauma centers and intimate partner violence: Are we doing our share? J Interpers Violence 2009;24:2096-108. 18. Intercooled Stata v.10. Stata Press, STATA. 2001: College Station, TX. 19. EZ-Text (v4.0, 2006), Centers for Disease Control and Prevention. Atlanta, GA. www.cdc-eztext.com.